The upcoming primary face-off between incumbent Gene Green and Adrian Garcia in Houston's 29th congressional district will test case the influence of identity politics in Texas Democratic races. HOUSTON — The bright green “Gene Green U.S. Congress” sign was planted firmly in the lawn of Alice Alexander Gallegos’ home in Houston’s Northside neighborhood. But it was her husband’s doing, she says. She’s still on the fence between voting for the longtime incumbent congressman or his surprise challenger Adrian Garcia, the former Harris County sheriff she supported in his unsuccessful Houston mayoral bid last year. Drawn in 1991 to reflect the area’s booming Hispanic population, the Houston-based 29th Congressional District has never been represented by a Hispanic. But the upcoming face-off between Green, who is white, and Garcia — and the fight for voters like Alexander Gallegos — is proving to be a test case on the effectiveness of identity politics in modern Texas Democratic races. 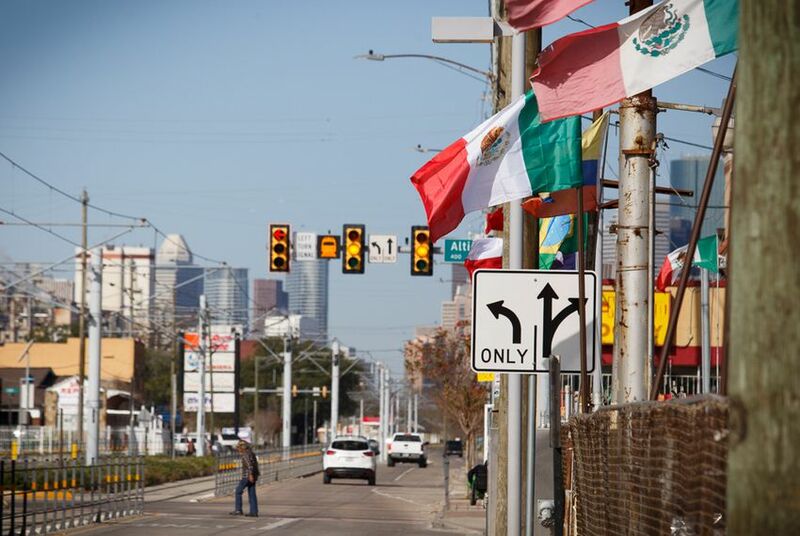 The district, which stretches from north Houston to Pasadena and South Houston, is 76.3 percent Hispanic — up from around 60 percent when it was first created. Whites make up 11.8 percent of the population, and blacks round out the district with 10.7 percent. Since his surprise last-minute decision to challenge the 24-year incumbent in the March 1 Democratic primary Garcia has insisted his congressional aspirations are rooted in his desire to “be a voice” for the growing Hispanic community. But in an interview with The Texas Tribune, Garcia insisted that adequate representation doesn't depend on electing a Hispanic, but it does require someone who will be outspoken in the face of attacks on the Hispanic community. But Green, who has represented the district since 1992, says his actions speak louder than words. He points to events he’s organized — immunization clinics, drives to assist legal residents applying for citizenship and college application workshops — as indications of his commitment to the Hispanic community and the issues that matter most to it. “I think we’ve been the selection just because I think I’ve earned it by doing a lot of things for the district” and its predominantly Hispanic community, he added. The race sets up a showdown that is expected to come down to voter participation in an area known for voter apathy. Only 6,244 voters cast a ballot for Green in his last uncontested primary in 2014. At least 250,000 district residents were registered to vote that year; half of them had Spanish surnames. Even in the 2008 Democratic primary — which featured a contested presidential primary at the top of the ballot — only 42,222 voters cast a ballot in Green's race. The race will provide a clear glimpse into whether Hispanic voters actively distinguish between “substantive representation — voting for someone based on how well a candidate will represent their needs — and “descriptive representation” — based on “who looks like the majority of the people” in that district, said Jeronima Cortina, an assistant professor of political science at the University of Houston. It’s a distinction that has yielded mixed results in other Texas elections where smaller voting groups turn out at higher rates than Hispanics. In a race between two minorities last year, San Antonio voters chose Ivy Taylor, who is black, over Leticia Van de Putte, who is Hispanic, as mayor even though Hispanics make up 63 percent of the city's population, while whites comprise almost 27 percent and blacks 6.9 percent. Meanwhile, U.S. Rep. Lloyd Doggett, D-Austin, has held onto a seat in Congress amid several redistricting fights. Doggett kept his previous seat in the 25th Congressional District even when it shifted from its Travis County-centered configuration to stretch down to predominantly Hispanic Laredo. When that district was redrawn, Doggett took Congressional District 35, which now stretches between Austin and San Antonio. In the 2012 Democratic primary, Doggett, who is white, fended off two Hispanic challengers in a district that’s nearly 63 percent Hispanic. And Garcia, who aspired to be the first Hispanic Houston mayor, saw his demise in an election where the strength of the Hispanic vote in the state's most populous city ran into a tide of non-Hispanic, mostly Republican voters who turned out to vote down a nondiscrimination ordinance. Despite increased turnout among Hispanics, Garcia failed to make it into the runoff against Sylvester Turner, who went on to become mayor. Voters in the district appear divided on the idea that minority voters will only vote for minority candidates. Green has picked up endorsements from the district's Latino leadership, including state lawmakers whose districts overlap Green's turf, and labor groups. Meanwhile, Garcia has touted support from the African-American Sheriff's Deputies League and the leader of the NAACP's Houston branch. For Freddy Blanco, chair of Houston's precinct 72 in the Mason Park area, the hope is that the district's Hispanic voters will look past race and make a decision on the "benefits" each candidate can provide. "It's not good enough just being Latino," said Blanco, who is supporting Green. "Why does it have to be a race thing? It doesn't work that way." For others, the lack of a Hispanic representative reflects the long-standing patterns of low voter turnout among Hispanics. The hope is that this race will be a "step in the right direction" to remediate that, said James Douglas, president of the NAACP's Houston branch. "I think [Garcia] represents the interests of his district very, very well," Douglas said. "I also think it's about time we have a Mexican-American from Houston in Congress, but I'm not supporting him just because he's Mexican-American." Whether identity politics will play a role in awakening the "sleeping giant," a designation placed on Hispanic voters for more than a generation, remains unclear. Green beat a Hispanic challenger in a 1992 runoff election to win the seat and last faced a primary opponent in 1996, so it's difficult to predict March turnout, particularly in a presidential year. Garcia could see a slight boost from his Hispanic surname among low-information Hispanic voters that may be drawn to the voting booth by the presidential race at the top of the ticket. Research shows those voters are likely to cast ballots based on Hispanic surname if they know little about candidates — but it's unclear whether that will get Garcia very far. He could end up splitting those votes with the third challenger in the race, realtor Dominique Garcia (no relation). The Hispanic surname phenomenon confronted former state Sen. Wendy Davis in her 2014 gubernatorial bid. Davis won the statewide Democratic nomination handily, but she lost several border counties with large Hispanic populations to Corpus Christi Municipal Court Judge Ray Madrigal, a virtually unknown candidate. Madrigal had no statewide name ID and did not raise or spend any money on his campaign. But Davis trailed Madrigal in several counties, losing by almost 30 percentage points in Starr County. But the Hispanic surname boost is more likely a deciding factor in low-information elections where candidates are largely unknown, said Sylvia Manzano, principal strategist at the political polling organization Latino Decisions. Green is a longtime incumbent well known in the district, while Garcia is riding high name identification from his time as sheriff and the high profile mayoral race at the end of last year. “Identity politics by itself isn’t enough,” Manzano said, but it plays a bigger role in a race where “all other things being equal” you have two candidates voters share a "personal affinity" with and believe to be well qualified.